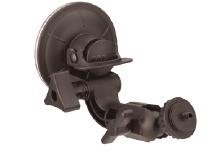 A powerful suction pad attaches this mount to car, truck, van and SUV windows. Designed for temporary surveillance or in-vehicle camera systems. Ideal for POV cameras, camcorders and action sports cameras.